In our Alphabet work, we are listening to alphabet stories, brainstorming words that begin with the letter of the week, and teaching the alphabet sounds and the correct letter formation for the upper and lowercase letters. 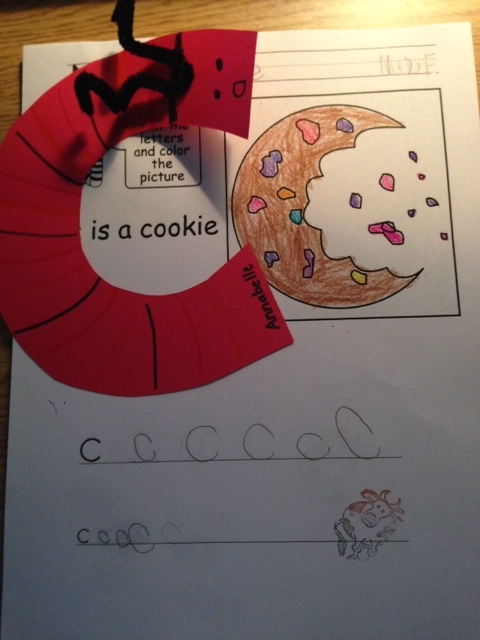 “C” is our letter of the week. We made our delightful caterpillar “c’s” which we will send home next week. We will profile each letter we worked on in the newsletter, but the children’s alphabet craft and printing sheet will not come home until the following week. But we’re not just teaching the Alphabet. As part of our balanced approach to literacy instruction, we’re developing the children’s phonological awareness in the areas of sounds, syllables, rhymes and words. Over the past few weeks we’ve been working on words, specifically focusing on syllables or parts of words. Right now, the children are listening to the teacher say the parts (syllables) of words, then blending them together to say the complete word (eg., kit-chen = kitchen). This is all part of oral language instruction which includes read-aloud books and storytelling, shared reading experiences such as poems, songs and chants and our teaching of the individual alphabet letters and sounds. When we’re talking about sounds, we mean phonemic awareness, or the awareness that speech is made up of sounds in a specific sequence. For more on phonemic awareness and phonological awareness click here. You can imagine how important the children’s self-regulation is during oral language instruction. It’s why we work so hard with our students all through the year on their listening skills; calming strategies to prepare themselves for instruction; mindfulness to focus and concentrate on the lesson and a positive attitude to foster a lifelong love of learning. We listen to calming music, practise deep breathing and mindfulness daily, so that we are feeling relaxed, happy and in the green zone — ready to learn! In Math, we are creating AB and ABC pattern multilink trains. The children are learning a pattern needs to be repeated three times (eg., ABABAB) to show it is indeed, a pattern. The children saw their beloved Grade 7 Big Buddies on Wednesday. We’re beginning a new seasonal activity in Buddy Reading where our Big Buddies will select picture books to read aloud to their Little Buddies. Then the children will work on some literary awareness skills (title, directionality, one-to-one word correspondence) and finally, draw a picture and talk about their favourite part. We had a practise run this week, and will start officially with a fun Hallowe’en picture book in a couple of weeks. Thank you so much to everyone for sending along rainboots and raincoats this week. The children have achieved a high level of independence in changing into their boots and coats, necessary for Westcoast living. Although we still have lots of inside-out sleeves (they make fun wings), we’ve made significant progress since September. Please remember that if your child wears shoes with laces to school, he or she should know how to tie those laces. Tying laces is not a skill we teach in the Kindergarten. We will be adding a sharing component to our Special Helper program next week. In addition to the daily Special Helper duties, the Special Helper will have the opportunity to bring in a special sharing. Our sharing always has a theme and for the month of October and November our theme is “I Like Me”. The students are asked to bring in three objects that tell about him or herself. These objects should fit into a small Ziploc bag. There is more information posted on the parent boards and a sample Ziploc bag. The student calendar is also posted. Please help your child gather these items a few days prior to their Special Helper day and have them practice “sharing” with you. Monday, October 17: Parent Teacher Conference Sign-up. The sign up sheets will be posted outside of the office. Friday, October 21: Provincial Professional Day. School is not in session for students. Monday, October 24 and Thursday, October 27: 2:00 Early Dismissal for Parent Teacher Conferences – please be on time to pick up your child as we start our conferences promptly at 2:10 pm.